I have been quite busy as of late. 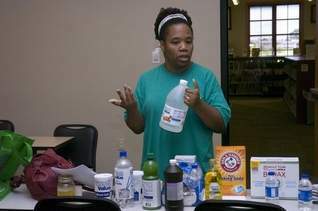 I’ve been teaching Eco-Friendly classes at our local library for the past few months, and, at the last class, a photographer from the local paper showed up and snapped photos. A few days ago, a reporter contacted me and I was interviewed. The article appeared in the Features Section of the Sunday paper, as well as on the web site. I wanted to share the recipe that accompanied the article. Grate bar of soap and add to saucepan with water. Stir continually over medium-low heat until soap melts and dissolves. Fill a five gallon bucket half full of hot tap water. Add melted soap, washing soda and Borax. Stir well until all powder is dissolved. Fill bucket to top with more hot water. Stir, cover and let sit overnight to thicken. Stir and fill a used, clean laundry soap dispenser half full with soap and then fill rest of way with water. Shake before each use. It will gel. This entry was posted in Nature Study, Science, Yadda Yadda and tagged eco-friendly, healthy skin, laundry soap, natural cleaning, oma's favorite. Bookmark the permalink. ← Where have we been?? 4 Responses to They call me… MRS. CLEAN! You have been busy. Good for you. OH I added a link to your store on my site. It’s under “My sisters who keep shops”. I started out making liquid laundry soap and now i do the dry version. Much easier for me to do. No icky fingers. LOL I think it is great that you are having success with your home business and it is an EXCELLENT teaching tool for the kids. Way to go!!!! !